In mid-July of 2004 I received a phone call from a London-based Sikh young man who wished to have a wonderful and unique kirpan created. It was still prior to the current world economic recession and he seemed willing to invest in something that was quite unique. After numerous phone conversations and some sketches back and forth we conceived a rather large, beautifully embellished Kirpan. On its completion in 2005, I decided a fitting name for this one-of-a-kind Kirpan would be ‘Tribute to Darbar Sahib’, since on a sterling silver panel on the scabbard is engraved an image of The Golden Temple filled in 24kt. gold and surrounded by diamonds. In late 2009, I was invited to be the sole guest artist at the 2010 Sikh Centennial Foundation Gala. This event is held around Baisakhi time at the Royal Ontario Museum in Toronto. I contacted my client in London to see if he might be willing to allow me to borrow this special piece back for this exhibition. He said that he was willing to send it back to me. He also told me that the downturn in commercial real estate had been hard on his cash flow of late and invited me to try to sell the Kirpan for him because it was a bit large and heavy for him to wear. At the time, we were planning several other Kirpan projects including a large Khanda that he wanted made. This kirpan has beautiful and colorful Ocean jasper (a natural mineral from Madagascar) for its handle and matching sheath/scabbard. All the fittings are created from Argentium sterling silver, a highly non-tarnishing sterling silver. These fittings are encrusted with 10.75 carats of fine diamonds (approximately 600 stones) and 43.5 carats of green tourmaline. All the engraving, 24kt. gold inlay and gemstone and diamond setting was done by Julie Warenski-Erickson from Utah, USA. A 9 inch stainless Damascus steel blade has 24kt. gold inlaid script from the Sikh scriptures. 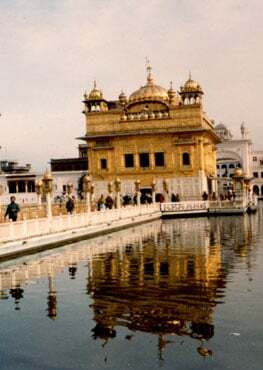 On one side – "Ek Ong Kar Sat Gur Prasad" and on the other side "Waheguru Ji Ki Fateh!" The entire ‘spine’ of the blade is handcarved in a decorative manner with floral motifs. 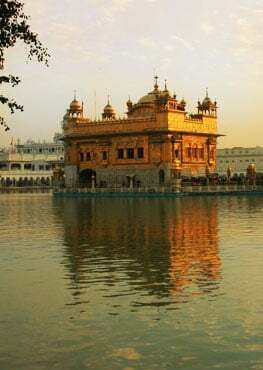 The beautiful rendering of Darbar Sahib is engraved in 24kt. gold on the scabbard and has diamonds set around it. Some have referred to this Kirpan as one that might be called the finest ever created. My experience with historic weapons, including Kirpans, is that fabrication standards held in the past are not near as high as those held by my contemporary knife and swordmaking colleagues as well as myself. This one of a kind piece was awarded "Best Art Knife" at the Chicago Custom Knife Show in September of 2005. The image of this unique kirpan has been 'borrowed' numerous times since being posted on www.KhalsaKirpans.com. It has been used on the homepages of websites and even was used on the cover of a published book. Although the retail selling price is USD 43,875.00, I am prepared to offer this unique one a kind Kirpan for USD 40,000.00 with a portion of the proceeds to go to charity.